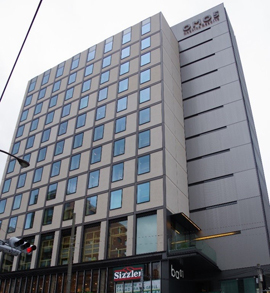 OMO5 Tokyo Otsuka, representing a new brand of hotel from Hoshino Resorts, opened in front of Otsuka Station in Tokyo on May 9, 2018. Focusing its target on tourists, OMO is a new style of hotel realizing facilities, guest rooms, and services differing from those of ordinary city business hotels. The following is an introduction to some of the measures designed to help guests enjoy both the inside of the hotel, including the attractions of its lobby and guest rooms, and the neighborhood. About a minute’s walk from the north exit of Otsuka Station on the JR Yamanote Line you will see a large building with the OMO5 logo looming from its top. 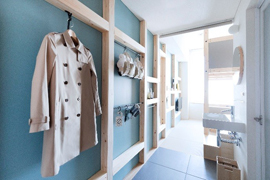 This is a new type of hotel, OMO5 Tokyo Otsuka (125 guest rooms), developed by Hoshino Resorts. 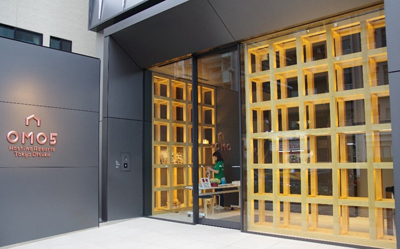 The first-floor (ground-floor) entrance has a wooden-lattice decoration, so you cannot miss it. 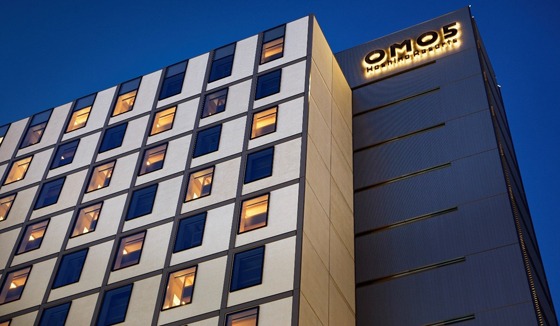 OMO is the name of a hotel brand newly launched by Hoshino Resorts with the concept of realizing “urban tourist hotels that offer more than just a bed and enhance the excitement of travel.” The first OMO hotel, OMO7 Asahikawa, opened in Asahikawa, Hokkaido, in April 2018, and the one in Otsuka is the second. 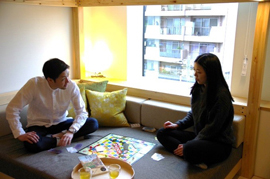 At a launch event, President Yoshiharu Hoshino of Hoshino Resorts said, “Viewing the whole neighborhood around the hotel as a single resort, we aimed to realize a new style of urban tourist hotel that bonds with attractions in the vicinity.” The strong point of the OMO hotels lies in their focus on tourists. As a result, President Hoshino explained, “Locations change, facilities change, and services change.” How specifically will the OMO hotels change the lodging experience? 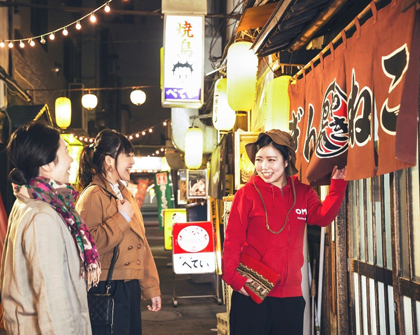 Let’s find out by taking a look at the attractions of OMO5 Tokyo Otsuka. Inside the wooden-lattice entrance, the elevator takes you up to the hotel lobby on the fourth floor. On the wall on the left side of the passage there is a large map of the hotel’s neighborhood, measuring two meters in height and three meters in width. 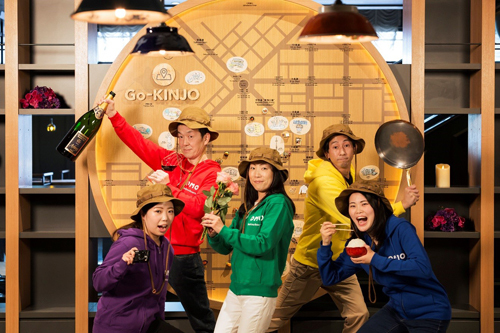 Called the Go-KINJO Map (Neighborhood Map), it is one of the two principal services offered by the hotels new Go-KINJO initiative. Armed with a thorough knowledge of the neighborhood, OMO staff select spots of interest at their own discretion and write them on the map, which is constantly updated. Recommended routes for the day are also shown, so guests can check the latest neighborhood information before venturing outside. The other highlight of the Go-KINJO initiative is the OMO Rangers. In a new type of local guide tour, OMO staff act as rangers to show guests around town in a friendly manner. In this way, guests get to learn about local attractions that are not introduced in guidebooks and, as they come into contact with various events and goods, immerse themselves in the community. 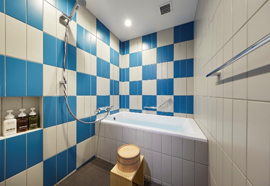 Hoshino Resorts has put a lot of thought into the spatial design of its facilities so that guests who return after enjoying local attractions and sightseeing will have a good time back at the hotel too. 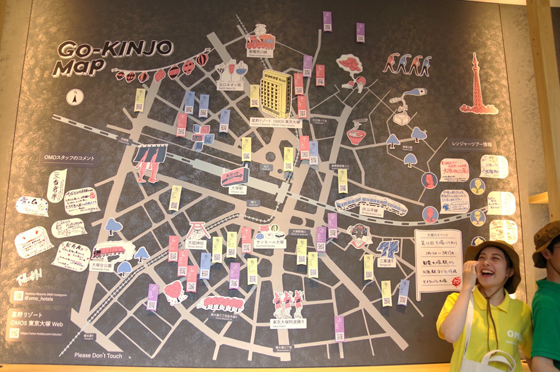 At the end of the passage displaying the Go-KINJO Map there is a spacious lobby lounge called the OMO Base, which, through design befitting the locality and the supply of local information, endeavors to connect guests and the local community. 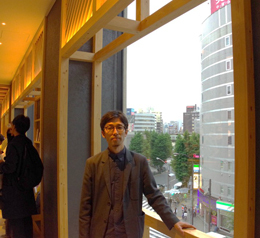 Like the first-floor entrance, the design has a wooden-lattice image. 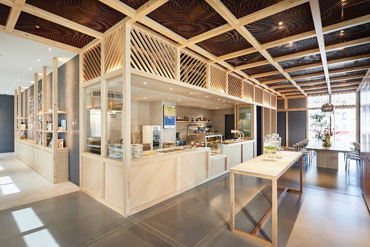 The interior wooden lattices also play an important role in the external design of the hotel. 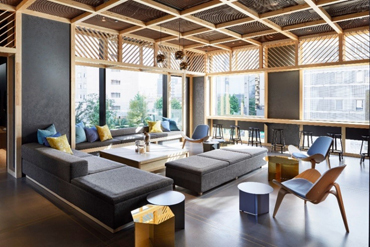 After repeated consultations with Takenaka Corporation, which was in charge of overall design and construction of the hotel, President Sasaki decided to link the façade and the interior with the wooden-lattice image. Furthermore, by making the openings larger, the interior wooden lattices in the lobby and guest rooms were made visible from the outside, so the interior also came to play an integral role in the façade design. Affectionately known as Yagura Rooms, the OMO guest rooms do away with the conventional image of hotel rooms as only places to sleep. Their layout is designed to maintain the excitement of travel by enabling guests to have fun even after coming back. ”We managed to achieve a guest room layout that has no parallel in other hotels around the world,” stated President Hoshino with confidence. The characteristic of the Yagura Room is the raised Yagura Sleeping Quarters, which was installed at the request of President Hoshino, who wanted each guest room to have a capacity of three to four persons. 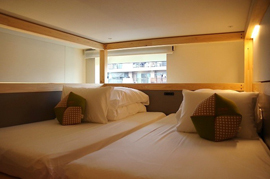 Each guest room at OMO5 Tokyo Otsuka has an area of about 19 m2. In ordinary hotels, only beds can be installed in such a space, so it is rather cramped if three people stay there. The only place for guests to relax is on top of their beds. 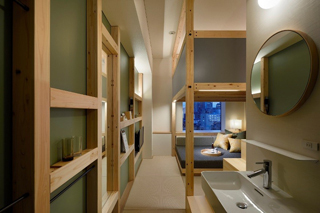 But by introducing the raised Sleeping Quarters, Hoshino Resorts made it possible for the space below to be used. The company has designated the space below the beds as sofa space for relaxation, which it calls the Relaxation Quarters. 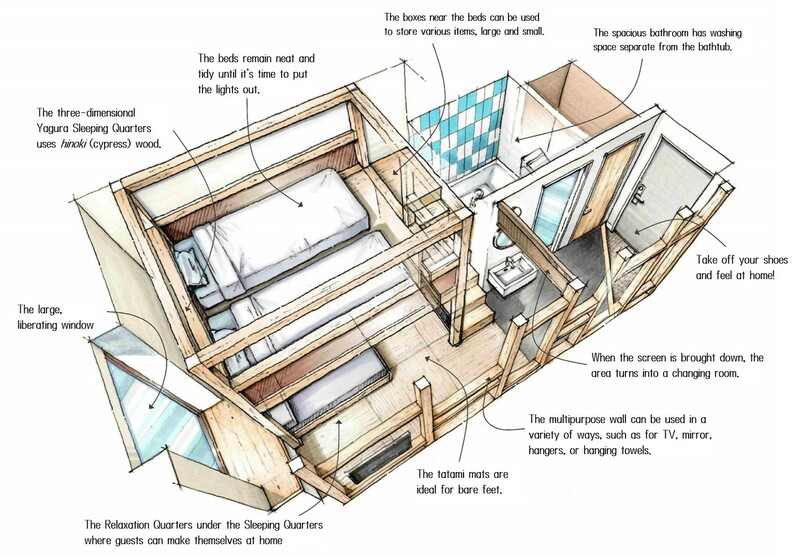 As a result, the 19 m2 room has a capacity of three guests. In addition, as in a private house, when guests enter the room, they take off their shoes. So even when not using the sofa space, they feel quite at home. They were also particular about the choice of materials for the interior. 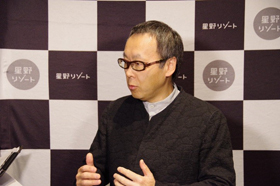 President Sasaki explained, “Centered on the hinoki in the Yagura Sleeping Quarters, the basic material is plain wood. We also used tatami mats for some of the floor. The use of many natural materials creates a very Japanese atmosphere.” Such detailed plans, he added, have led to the completion of a hotel that “maintains the excitement of travel by enabling guests to have fun in their rooms even after coming back” and offers a Japanese style of relaxation. Launched in 1976, Nikkei Architecture is a general architectural magazine that carries wide-ranging information from social and economic trends surrounding the architectural world to practical management, including specialized areas like design, structure, and construction. The magazine has about 30,000 readers involved in architecture, including qualified first-class architects, architecture companies, and government officials. As well as the magazine, the Nikkei xTech website provides timely information on the latest trends too.